Eric Hilliard Nelson, better known as Ricky Nelson or Rick Nelson, was an American singer-songwriter, instrumentalist, and actor. He placed fifty-three songs on the Billboard Hot 100 between 1957 and 1973 including "Poor Little Fool", which holds the distinction of being the first #1 song on Billboard magazine's then newly created Hot 100 chart. He recorded nineteen additional top-ten hits, and was inducted into the Rock and Roll Hall of Fame on January 21, 1987. Rick Nelson was the singer and actor for whom the phrase "teen idol" was coined, according to Kent Demaret in People magazine. Using his family's television show, "The Adventures of Ozzie and Harriet" as a launching pad for his musical career, Nelson had many hit records, including "Poor Little Fool," "Travelin' Man," and "Hello, Mary Lou," throughout the late 1950s and early 1960s. But despite his wholesome good looks and television star status, most music critics agree that Nelson was more than a manufactured pretty face to be lumped with the likes of Fabian and Frankie Avalon. 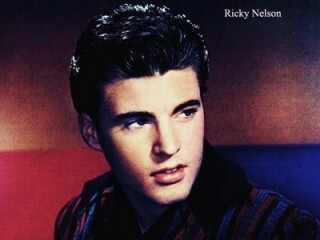 Demaret quoted rock critic David Hinkley as saying that "'the deceptively clean-cut kid named Ricky Nelson' helped 'smuggle rock and roll into American living rooms,'" and rock historian Greg Shaw as declaring, "Of all the Hollywood teen idols, only one can be said to have any claim to lasting importance--Ricky Nelson." On the occasion of Nelson's 1985 death in a plane crash, fellow rock musician John Fogerty (formerly of Creedence Clearwater Revival) offered to David Fricke in Rolling Stone the following tribute: "He was Hollywood, but the records he made were totally legitimate rockabilly, as good as any of the best stuff from [early country-rock recording company] Sun Records." Born Eric Hilliard Nelson on May 8, 1940, in Teaneck, New Jersey, Rick got his start in the entertainment field when he first appeared on his parents' radio program in 1948. His father and mother, Ozzie and Harriet Nelson, had had a family show on the radio previous to that, but until 1949 other children had played the parts of Rick and his older brother, David. When "The Adventures of Ozzie and Harriet" moved to television in 1952, the youngest Nelson helped make the program one of the most popular early sitcoms. To the American television audience, "Ricky was the darling gnome next door, wolfing down chocolate malts and diligently minding his p's and q's," according to Fricke. But as Rick grew older, he became interested in the rockabilly music being produced on the Sun Records label by artists like Carl Perkins and Jerry Lee Lewis. Legend has it that a girlfriend's enthusiasm for the swivel-hipped rocker Elvis Presley led Nelson to boast that he, too, was going to make a record; at any rate, that was the way the situation was presented on the 1957 "Ozzie and Harriet" episode on which the aspiring singer made his musical debut. After Nelson performed on national television the first song he recorded--a cover version of rock pioneer Fats Domino's "I'm Walkin'"--the single sold a million copies in one week. Following a couple more releases on the Verve label, Nelson signed with Imperial--Domino's label--and proceeded to turn out hit after hit. Ozzie Nelson, closely involved in his son's new career, made a point of showcasing most of Rick's records on the television series. In effect, as Demaret pointed out, the promotion tactic made Rick Nelson "the first rock-video star." "The Adventures of Ozzie and Harriet" ran until 1966; by the time it went off the air Nelson had earned at least nine gold records and sold over thirty-five million copies of his hits. Some of the most memorable of these are 1957's "Be-Bop Baby" and "Stood Up," 1958's "Lonesome Town," 1959's "Never Be Anyone Else But You" and "It's Late," 1962's "It's Up to You" and the autobiographical "Teenage Idol," and 1963's "Fools Rush In." By the end of his family's television show, Nelson, like many other American rock and roll artists who began their careers in the 1950s, found his popularity being eclipsed by British acts like the Beatles. No longer making hit records and out of an acting job, he decided to pursue his longtime interest in country music. Nelson made a few country albums and scored a minor chart hit with the song "You Just Can't Quit." Then he heard folk singer Bob Dylan's album excursion into country, Nashville Skyline, and was inspired to form a country-rock group, the Stone Canyon Band. With them, Nelson released Rudy the Fifth in 1969 and scored another minor hit with a remake of Dylan's "She Belongs to Me." Though Nelson himself did not make a major impact with the music he played during this period, the work was a major influence on later rock groups such as the Eagles and Fleetwood Mac. Nelson's last and best-selling hit record was the result of an unpleasant experience for him. In 1971 he was invited to play an oldies concert in New York City's Madison Square Garden. In this period of his life Nelson usually scorned nostalgic celebrations of the early rock and roll that brought him success, but the prestige attached to a Madison Square Garden performance overcame his reluctance. Though he played a few old favorites, he interspersed new material among them, and was booed by the audience. Deeply hurt, Nelson protested his treatment in his 1972 single, "Garden Party." As quoted by Fricke, the song contained the disdainful lines: "If you gotta play at garden parties/ I wish you a lotta luck/ But if memories were all I sang/ I'd rather drive a truck." Ironically, the promoter of the Madison Square Garden concert, Richard Nader, told Fricke that Nelson had misinterpreted the crowd's reaction: "Coincidentally ... in the top tier there were some rowdies. The cops were moving them out, and the people were booing the cops.... Rick thought the booing was for him." "Nelson had apparently come to terms with his past," according to Michael Goldberg in Rolling Stone, and was performing in rock and roll revival concerts prior to his death. His last performance was at a friend's night club in Guntersville, Alabama, and he was en route to another concert in Dallas, Texas, when his private plane crashed near De Kalb, Texas, due to a heater fire. -Every Thought of You Decca, 1964. Spotlight on Rick Decca, 1965. -Love and Kisses Decca, 1966. -Another Side of Rick Decca, 1968. -Rudy the Fifth Decca, 1969.